It’s a joy to set out a basket of these moist muffins. 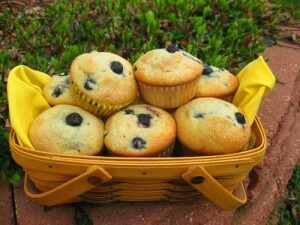 These are my all time favorite muffins, and you’ll find its hard eating just one! Preheat oven to 375. Cream margarine and sugar together. Add eggs and beat until smooth. Mix in sour cream and vanilla. Combine dry ingredients and stir into creamed mixture. Fold in blueberries carefully. Using an ice cream scooper, scoop into muffin pan that has been sprayed with oil. Sprinkle sugar on top. Bake 25 minutes. * When using cranberries, add a half cup of sugar to your recipe. Makes 12 muffins. This entry was posted on Tuesday, March 2nd, 2010 at 10:16 pm	and is filed under Recipes. You can follow any responses to this entry through the RSS 2.0 feed. Both comments and pings are currently closed.